Whew! So, I thought that I would be able to finish this up this weekend, due to the fact that we Alaskans had our own holiday today (thank you for your folly, Mr. Seward) to make it a three-day weekend, however I underestimated my ability to re-think a project as it is being created. 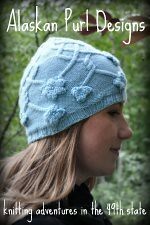 Which means, I keep making it bigger and bigger in my mind so I feel the need to make more and more squares to make it so! With the way I originally had the layout graphed out I required 64 small squares (currently have 43 done), 12 medium squares (currently 9 done), and 9 large squares (currently 7 done). By my calculations this would have made a blanket that was about 5.5' x 5.5' before blocking. After blocking, I was hoping for 6' x 6', but I really had no idea. I just wanted something beautiful and vintage-esque to have in our living room and make its home on the back of my recliner/knitting studio. BUT, as I was laying out the squares, it just didn't seem big enough to me, so I decided to add another panel and make it bigger. 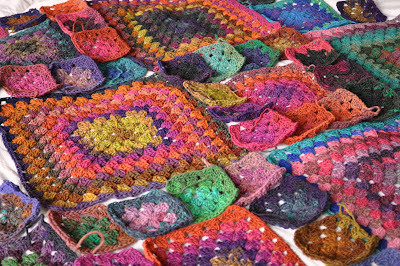 Problem is, this now requires 96 small squares, 16 medium squares, and 12 big ones. 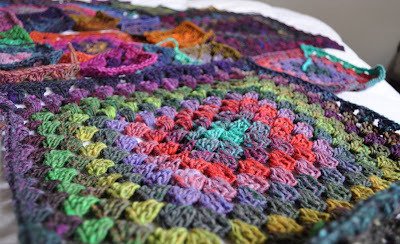 I ordered more Noro for this (which completely defeats the purpose of making this a stash-reduction project) and now I'm just hoping that I get it done in time for the May 1 Skagway Artists in Residence showing. 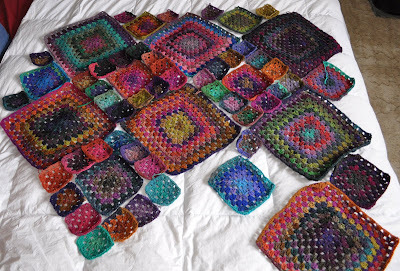 Because not only do I have that to get finished, but I also have to finish a felted bag/pattern for a submission by June 1, do a felted bag for a bag exchange I signed up for (Ravel It) by May 1, five potholders for a potholder exchange by June 1, my dad's Hemlock Ring Blanket by May 1, a scarf for my friend, Sarah, which I promised by mid-April, etc. Plus, since the season is just around the corner, I'll be starting to put in extra hours on the weekends to get everything in place by the time the first ship arrives. Ahhhhhh! I always bury myself too deep with not enough time to dig myself out. 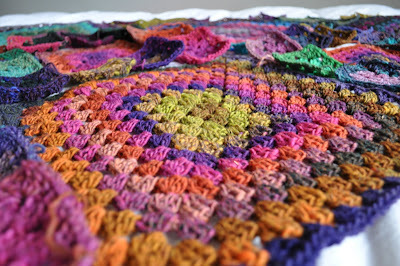 Anyway, here are some more photos of the blanket in progress. 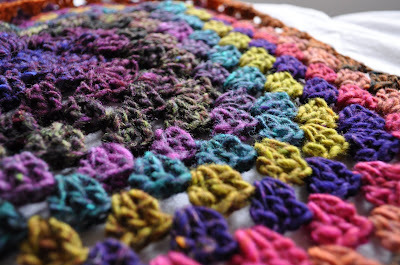 I love granny squares because they're so easy to just zone out and do while watching tv. Before I know it, I have ten of the little ones done in about an hour. I only wish the big ones were so easy. They seem to drag on, but it's a nice change to alternate through the sizes so I don't get sick of doing any particular one.